Light wood, layers, functional shapes and friendly colours. As soon as the idea of Scandinavian Design arose, these associations were near and enthusiastic since the middle of the last century, one generation after the other. It is not surprising, that the Scandinavian Design had such a large fan club: its reduced language form is practised all over without interruption. The use of organic material and a certain pragmatism create a warm and inviting impression. The Scandinavian Design has set its mark over the last six decades in international design. This is not only the case in equality between shape, function, stability and costs, but also in skilful marketing. For very long the Scandinavian countries have decided to have a similar appearance in international design: The very first time The Scandinavian Design idea arose was in 1951 during the London Exhibition "Scandinavian Design for Living". The Exhibition presented Furniture, glass and textiles of different Scandinavian Designers. These were connected to the coming modernisms of Germany and France with traditional Scandinavian handicraft made of local materials like birch wood, glass, clay and cloth. The exhibition that followed "Design in Scandinavia" toured the USA and Canada from 1954 to 1957 and established the Scandinavian Modernism also internationally. From the beginning the concept of Scandinavian Design went in with an agreed presentation of the Scandinavian business: The use of organic materials was interpreted as the Scandinavian love of Nature and the simplicity and functionality of furniture as a symbol of the equal, democratic lifestyle. Especially in Germany after the Second World War, these social and democratic ideas that emerged in Scandinavian Design were very popular. Cheap mass production and new manufacturing techniques made good design for everyone possible. The technology of laminating wood with the help of dampness, played an important role for the success of the Danish furniture manufacturers Fritz Hansen. 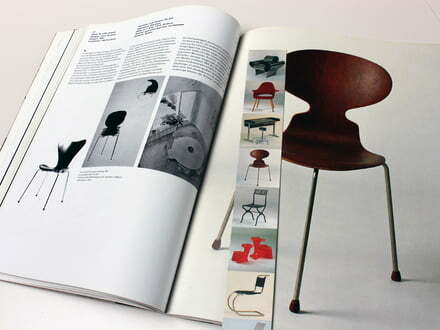 The design of the Ant Chair by Arne Jacobsen from 1952 is until today the most popular chair of the company. One finds it in schools, canteens and private houses. The classical Scandinavian Designer is a definite source of inspiration for many younger design companies. Through the influence of the international designers and the claim of many manufacturers, the classic Scandinavian design language for expanding and enhancing new perspectives, Scandinavian furniture receives more and more modern movements. The personal experiences of the designer should shape the product's form, so that the Scandinavian Design is always contemporary and relevant. These new influences ensure that the Scandinavian furniture does not become obsolete, but that future generations can still enjoy its functional elegance! &Tradition &Tradition's goal is to bring something special into the lives of people. The company, which is based in Fredensborg, Denmark, specialises in the distribution and production of newly launched design classics. ArchitectMade ArchitectMade – intelligent art for every day. Aesthetic shapes and modern appearance have made numerous Danish products into design icons of the 20th century. ArchitectMade presents a unique selection of the very best Danish design. Design House Stockholm The Design House Stockholm is one of the leading producers of contemporary Scandinavian design products that simplify and embellish everyday life. Fritz Hansen Furniture from the Republic of Fritz Hansen is of course a part of the leading architecture in the world in its time. The company has been writing its success story, which was significantly influenced by star designer Arne Jacobsen since 1872. Georg Jensen Georg Jensen Living transfers fine design to everyday life objects with materials such as stainless steel, wood and aluminium. The classic Northern style combined with their function in everyday life transforms these things into art objects. Hay The aim of Hay design is to give new life to the Danish furniture design of the 50s and 60s. Instead of simply copying the old masterpieces, Hay furniture redesigns the pieces in a modern, contemporary context. Holmegaard Holmegaard in Denmark has been home to the traditional glassworks since 1825. The company, founded by Countess Henriette Danneskiold-Samsøe on a peat bog, is one of the most modern factories in glass production today. Iittala Against Throwawayism! Iittala creates good design that passes the test of daily use to combat throw-away mentality. Kähler Design At Kähler, the experience of classic craftwork are reinterpreted from a contemporary perspective. The result are exciting new ceramics that feature a new timelessness and individual character. Louis Poulsen Louis Poulsen is without a doubt one of the most prestigious and innovative lamp manufacturers. The lamps by Louis Poulsen are much more than just a guiding light in the dark. Menu Design The brand Menu stands for innovative products that are intransigent in quality. The development and the forming of the products are deep-seated in Scandinavian design tradition. Normann Copenhagen Normann Copenhagen has been founded in the year 1999 by Jan Andersen and Poul Madsen. The idea behind Normann Copenhagen was and is still to establish a new design approach. Rosendahl In 1993, Rosendahl launched ist first own design product – today, the Rosendahl collections comprise clocks, glass, porcelain and wine accessory. Stelton Stelton represents a very special view of the world, we call it "the Stelton state of mind." – the belief in surprising, innovative, functional and high-quality Scandinavian design. String The easy, modern design made the string shelves extremely popular shortly after their introduction in 1949. Designed by architect Nisse Strinning, String and String Plex have remained popular over the decades.